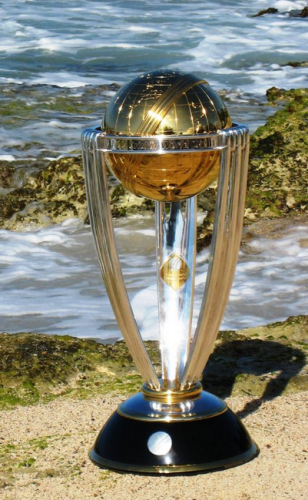 The ICC 2011 World Cup starts on 19th February 2011. The selectors led by K. Srikanth has selected the 15 member team. The team seems to be not really surprising except that it is packed with 3 spinners along with 3 part-time spinners. Rohit Sharma, Robin Utthappa and Pragyan Ojha seem to be the notable people not in the World Cup squad. What are you views on this selected team? Will it make India world champions ? Ganguly for me is the God of the off-side when it came to watching him bat. He was the first Indian captain who showed ego and aggression. The Indian team that buckled under sledging, suddenly started to sledge back and no longer was the Indian team considered the polite losers. IPL actions came and went by over a full two days. It was strange that Kolkata Knight Riders did not pick Ganguly up to lead their side. I think the KKR management must have had a collective brain aneurism to actually not pick Kolkata’s favourite Dada. 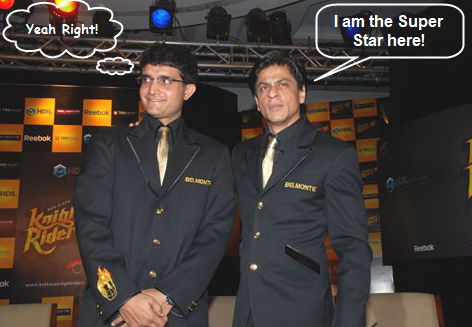 I could only think of these funny reasons for Ganguly being ignored this IPL by Shahrukh Khan’s Kolkata Knight Rider. Maybe when Gambhir’s name was called out, the KKR management heard it as Ganguly and went on a bidding war with other teams. Afterwards they realized it was Gambhir and not Ganguly. Alas Shahrukh Khan’s team was left with no money after buying Gambhir for over $2 million. Shahrukh Khan might be angry that all the attention goes to Dada when KKR play. He wanted to be the only star of his team. So what, if he cannot play cricket. King Khan will now be the only star of KKR. Maybe the bidding team forgot that KKR stood for Kolkata Knight Riders and not King Khan Rulez. Kolkata team that ignored Ganguly will not be liked even outside Kolkata. Anyways, IPL owners are known to bank on youngsters when it comes to shelling out money. But, strangely over the past three years Ganguly was the most consistent of their players. Maybe Ganguly should have taken a cue from Kumble and opted out of the IPL circus. The Ashes started at the GABBA in Brisbane today. The Australians were under pressure with England on a decent 197 for 4, it looked like England might post around 300 by the end of the day with a few wickets in hand. Peter Siddle was celebrating his birthday and decided to kick of the party but taking a hat-trick to crash England to 197 for 7. 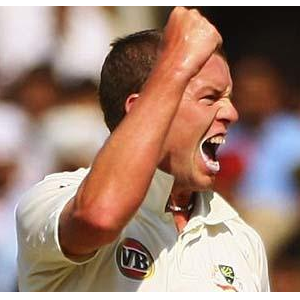 Peter Siddle ended up with 6 for 54. Do drop in your views and comments. Way back in 1998 Laxman was still making his way into the Indian team. He was in the ODI squad in Sharjah. The opponents at Sharjah were the mighty Australians led by Steve Waugh. Sachin Tendulkar was playing the innings of his life and on the other side watching him was VVS Laxman. Laxman was completely out of depth in that match and had a few nervous moments. It is ironic that VVS Laxman has chosen to make Australia his favourite opponents and pressure something that he thrives under. Just that today’s (5th Oct 2010) match into account. He managed to come out with an injured back, hang around and put together an impossible win taking India to victory by just 1 wicket. So what makes VVS Laxman very very special? 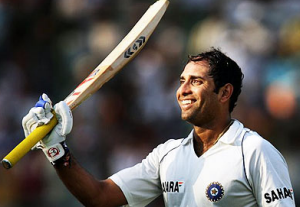 VVS Laxman has scored 7490 runs at an average of 47.40 in Test cricket. This is a healthy no for any test cricketer but what makes him special are his match winning innings. We must have lost count of the times Laxman scores run when India truly need those runs. In the table below are the runs scored and averages of Ponting, Tendulkar and Laxman in the 3rd or 4th innings of a test match. These numbers are usually much less flattering than career stats as all these innings are played under pressure and on a 4th or 5th day pitch. The table above shows that Laxman average while chasing or setting victorious scores is higher than his career average. No wonder VVS Laxman is India’s go to man. During IPL, children stay indoors even during summer vacations and adults suddenly have a sick stomachs and skip going to work so they can catch a game in their city. Nothing like that is happening with T20 Champions League cricket. I thought I will write down 10 reasons why this tournament is a flop show! No Lalit Modi: Love him or hate him. He did create a buzz and is a marketting genius. South Africa as Venue: Okay why would someone host the tournament in a place which has just hosted the FIFA World Cup. I means seriously is anyone in South Africa interested in Wayamba Elevens play Bangalore Royal Challengers after they have hosted the greatest show on earth? South African players are in IPL teams: Imagine if Sachin Tendulkar showed up for Lancashire and played against Mumbai in Wankhede!!! I think South African fans feel the same when Kallis and Steyn show up wearing red for Bangalore Royal Challengers. Unknown teams: Wayamba Elevens, Central Districts, Lions. Never heard of these teams and probably will not once this tournament is over. Countries Missing: Domestic teams from England and Pakistan are missing. Traditionally they would have added some spice. No match fixing scandal: Lets be honest! Now a days for a tournament to be successful it needs a few match fixing allegations to fly around. No Star Power: No Preity Zinta or Shahrukh Khan tweeting sadly about their teams loss. No bollywood stars pretending to be cricketing gurus. That obviously gets some people interested in watching the matches. No Sreesanth: Lets be honest we all look at Sreesanth wondering if he would rub some cricketer the wrong way again and get slapped on the face on national television. 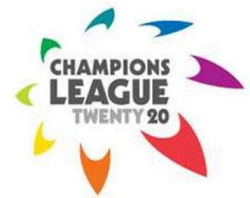 Sounds too similar to its Football version: T2o is growing in popularity but seriously I think I will choose UEFA Champions League matches any day over Airtel Champions League. Messi’s 3 goals are much better than Pollards 9 sixes. Too much cricket: If Indian public watches any more cricket chances are the economy will collapse. So people are getting their priorities right and giving this tournament a miss and working for a change. So these are the reasons Champions League cricket is a flop show. I am waiting for India vs Australia Test matches next month. Now that is truly a competition between champions. This year we had a tough cricket; even Indian team had hard luck in the ICC T20. There is nothing to be blamed with neither the selectors nor the commission. The Tri series leaves nothing to be described about our team young legs. The ICC WC 2011 is around the corner, India, Sri Lanka and Bangladesh going to host it. At this point of view, Indian team should concentrate on their game i.e. bowling, fielding & should consider few players to play their natural game. Hopefully the lord of the venue, Sachin Tendulkar will be playing. The opening pair will be very strong such that Sachin & Shewag will start the innings. Even the top order batsman will be filled out with Gambir, Raina & Yuvraj. The middle order will be taken care by our captain Dhoni. The lower middle order is the biggest question, no real guesses at all. The top lower order batsman will be Harbahjan. When it comes to seamer’s, Zaheer will be in the playing eleven. These eight players will be confirmed; only in case of any injuries there might be few changes. The areas to be focused by our team will be specially bowling & fielding. There are really big hitters in the squad, so no problem with that. When it comes to bowling, the economy of Indian team bowler is almost above Five & half. If this continues then the runs we concede in one match by our bowlers will be surely above 280+. The target becomes tough, in case of early wickets of our batsman. We lost the game. Next is fielding, there was few many misfield by our young legs in the Tri-series. This should be avoided in the ICC WC. Thus Players should be focused in fielding. When it comes to the playing 11, I left 3 players, in that one will surely be an all rounder, then the other two will be a seamer. Which players can be filled in that gap?? My guess will be, Praveen Kumar, though he can swing the ball in both directions & other possibility will be either Sreesanth or R.P. Singh. 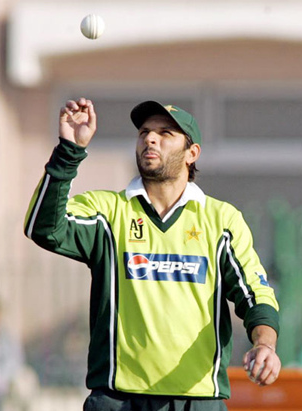 The all rounder will be Yusuf. I personally feel that, playing eleven with 3 regular seamers will be a correct choice. Posted byNarendran.M June 7, 2010 Posted inODITags: Cricket, ICC World Cup 2011, India, Team217 Comments on What could be India’s squad in 2011 ICC World Cup? Recently we discussed about Mahendra singh Dhoni, Captain cool to captain clueless and at the same time one video hit the you tube featuring Dhoni and his bunch of local friends. This video seems to be original as this has been recorded by his friend. Few abusive words are part of this video and I will suggest watch this video only if you have nothing better to do. Disclaimer: We take no responsibility for this video. This video has been uploaded by Youtube user Gyan1317. Such video hitting the internet might be a bad thing for Dhoni, specially at this moment when people are criticizing Indian cricket team performance in T-20. Cricket is a game that always has romance behind it. Small teams beat big teams, reputations are lost and made and teams find themselves in the dumps and manage to rise up from the ashes to become champions. That what a cricket tournament is all about and this ICC T20 World Cup is the same. Here is a bit on the four semi finalists and their prospects and what might drive them to become champions. Australia has won 4 world cup tournaments in the ODI format along with winning the Champions Trophy twice. They were ranked the no 1 in Test cricket for pretty much the last 15 years until recently when India and South Africa have started to outshine them. There is on silverware Australia has not won and that is the T20 World Cup trophy. So Australia would be desperate to win this time around when their side is probably the most complete and consistent running upto the semi finals. England has been a surprise in this tournament. They always had talented players but always ended up losing tournaments. When it came to major ICC tournaments unlike Australia which has won almost everything England has a empty trophy cabinet. So this would be a fantastic chance for them to start winning something on the world stage. Pakistan has had its cricket battered and injured. Sometimes by terrorists who fired bullets at visiting teams and at other times with their captain trying to bite the cricket ball. They are a group of rag tag team which play like champions one day and the next day play worse than a school team. Sometimes they play like both on the same day so they are unpredictable at best but they are defending champions and would love to show the world that they rule T20 cricket again. Sri Lanka is a fine unit. If you think about their performances they featured in T20 World Cup final last year. They also were runners up in the ODI world cup in 2007. It is obviously talented and have probably the best T20 bowler in Malinga. They would love to win this World Cup and usher in a new era in Sri Lankan cricket like Ranatunga did way back in the late 90s when they won the World Cup. So that finishes my views on what this T20 World Cup victory could mean to the four finalists. I have a feeling the Australia will end up winners in this edition. So who do you think will win the T20 World Cup? India has had a rich history of Batsmen who had wrists of steel and footwork fancier than a gazelle. But they have always had a problem facing short balling and always had a issue with unearthing good fast bowlers. India has always suffered when fast bowlers gave the batting order some chin music but off late India has had the Dravids and Tendulkars to deal with the short stuff and manage. But the T20 World Cup does not feature these old guys and we have new young breed of batsman who instead of playing a straight forward drive end up playing the scoop. 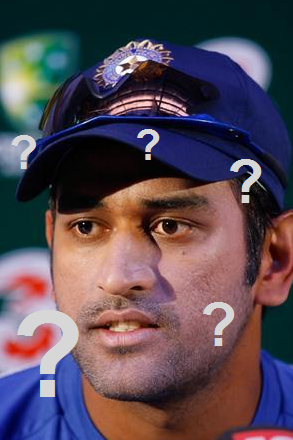 The performance of our batsman must have left MS Dhoni popularly nicknamed as Captain Cool as Captain Clueless. MS Dhoni won the toss on two occasions and decided that the pitch had a bit in it for the fast bowlers and so decided to bowl first to get early breakthrough. So far so good, but then India had two pacemen, one spinner and 5 part times spinners. So India ended up opening the bowling with Harbhajan Singh a spinner and used up his three overs with the new ball on a seaming wicket. So what followed against Australia and West Indies was pretty similar that part time spinners went for sixes and fours all the time and the only respite was when the batsmen thought of taking it easy. Strangely Indias big win against South Africa came while batting first and that was when Indian batsmen played out the new ball and hammered the older one. India is pretty much out of the T20 World Cup and will have to beat Sri Lanka and hope that Australia beat West Indies. Too many ifs and buts and frankly not so good for us fans who like a straight forward victory march. Dhoni is not to be entirely blamed for the bad show as some of the fancied names like Murali Vijay, Y Pathan and R Jadega have hardly made their presence felt.